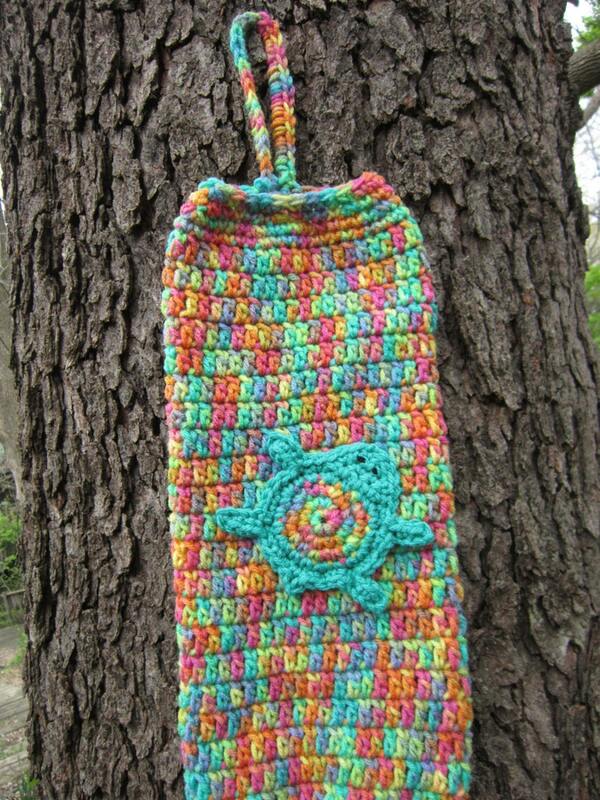 This handy turtle crochet plastic bag holder will hang almost anywhere to keep those plastic bags in reach for use. Keep it in the baby's room for used diapers, or in the laundry room to scoop the kitty litter box. Or near the door for when you're leaving to walk the dog. Or just keep it in your kitchen so you'll always be able to find a bag quickly. And the best part, is that this bag holder is so cute. Crocheted from varigated yarn, it's got green, yellow, pink, purple, and orange all mixed together. I've added a pink ribbon on the bottom to tie closed so that bags don't fall out. And it has the most adorable green and varigated turtle on the front to make it even more fun. It can be thrown in the washer and dryer if it ever gets dirty and will hold up to many washings. It measures 17 inches long, not including the handy handle for hanging. It is about 6 1/2 inches across laying flat. If you love this bag, but would like a different color to match your decor, please send me a convo and I'll get one made for you right away.